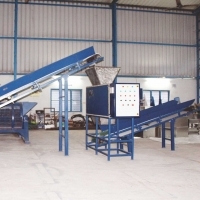 Plastic Shredding Machine by Zhangjiagang Lianguan Recycling Science Technology Co., Ltd.. Supplier from China. Product Id 611786.
blocks of wood, metal and so on. 4.The shredder is divided to the single and double shaft and four shaft. Supplier: Tape Extrusion Machine [ for making Woven Sack Tape PP/HDPE], Circular Weaving Machine [ for making Woven Sack tubular / flat fabric], 3. Extrusion lamination & Coating Machine[ for coating BOPP/Paper/Pond lining/lumber wrap etc. ], 4. Flexographic Printing Machine[ on woven fabric laminated / Un-laminated /Roll to Roll], 5. 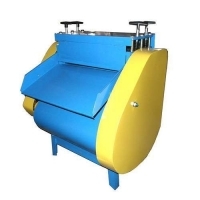 Bag Cutting and Stitching machine [ to make bag for Food grains/Fertilizer etc. ], ValveTech Machine - To make Valve bag [ to make Cement bag]. Automatic wire stripping machine : Wire Stripping Machine is a capable and easy to use stripping machine that most users have praised for its ability to strip large quantities of wire at a fast rate. Use and characteristic: This unit is in the digestion absorption overseas vanguard technology foundation, develops the successful new product, For continuous production craft, This unit has the structure to be compact, the ease of operation, the output are big, automaticity higher merit It is produces the plastic strap material essential equipment. This unit mainly by the extruding machine, the nose, the cooling trough, a hauling, the hot drying oven, two hauling, flask, three hauling, curl installment and electricity control system constitutions and so on embosses the installment, to decide, mainly uses in PP hitting bandage's production. Wooden box. This machine is widely used for sealing, welding, riveting, spot welding of thermoplastic parts such as electronic products, plastic products, stationery & toy, video & audio products, automobile & motorcar fittings , meters , household appliance , socket and plastic pipe as well as inlaying between metal and plastic products . This welder can transfer electric energy into ultrasonic energy by the ultrasonic transducer inside it and pass them to plastic work piece through welding noild and make its interface quake and scrape violently and produce heat of fusion to achieve the welding effects. The ultrasonic welded plastic workpiece has the characteristic of good quality , sealing and high-strength welding seam. By changing its welding mold , different area and shape workpiece can be welded. Wooden package. Wenzhou Tianxing Machinery Co., Ltd.
1 The screw and cylinder are nitrogenation treated and precise processed. So it is hard, wearable and anti-cauterization. 2 The whole set adopts perch brake driving. So the rewinding is very smooth. 3 The electric part adopts brake driving. So it can help to save power 30%. 4 The noise is low, no dust, environmental and power saving. Installing Dimensions (m)	13¡Á1.3¡Á1.2	weight	2000kw. Search More Like "Plastic Shredding Machine"